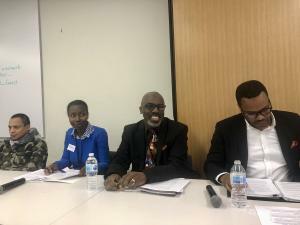 On January 7th, 2019, the Racialized Populations and Mental Health & Addictions COI hosted a think tank on Racialized Populations and Mental Health Court Diversion, to discuss the challenges and implications of being a racialized person going through the justice system. Over 120 participants joined in-person and via webinar, including service providers, case managers, mental health court support workers, persons with lived experience and family members, Legal Aid Ontario staff, Crown agency staff, police services staff, and other stakeholders. Click here to see the program and presenter bios. Review the CoI's think tank backgrounder report here. Click here to see the slides. Click here to watch the video of the presentation. Click here to see the Overview of the Criminal Justice & Mental Health Systems Map and the print out version here. Click here to see Uppala’s slides. Click here to watch the video of the presentation. Click here to see Akwasi’s slides. Click here to watch the video of the presentation. Click here to see Anthony’s slides. Click here to watch the video of the presentation. In your experience, do you think everyone going through the criminal justice system understands the process and what is happening? How do race and mental health interact to impact a person’s experience of the criminal justice system? How do other factors such as poverty, sexuality, ability, or immigration status affect a person’s experience of the criminal justice system? In your experience, are all individuals offered mental health court diversion equally, regardless of their race? Have you ever experienced or observed someone who could have benefited from mental health court diversion being denied due to eligibility requirements? 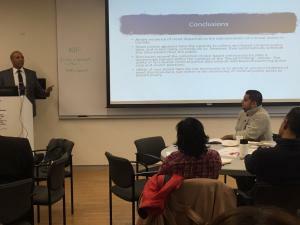 What obstacles do racialized individuals face when accessing mental health court diversion? What supports are available (or need to be made available) to individuals who do not qualify for mental health court diversion? Click here to watch the panel video. Group Discussions: How to Improve Experiences and Outcomes for Racialized Individuals with Mental Illnesses in the Justice System? What supports, services or resources are needed before charges are laid to prevent racialized individuals with mental health or addictions-related issues from interacting with the justice system? 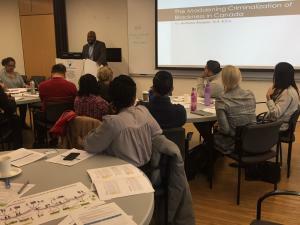 How can racialized individuals going through the justice system be made more aware of the process and what’s happening? Who should be promoting/recommending mental health court diversion? 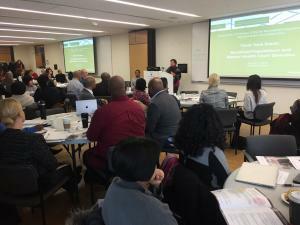 How can mental health court diversion be more accessible for racialized individuals and how can those who are not eligible receive the supports they need? How can mental health issues be identified in individuals who seek to hide their symptoms or whose symptoms are not apparent? Where in the criminal justice system pathway should race-based data be collected? For more information about the CoI, click here.